San Francisco Arcade Musuem. Execution was fun! So Thursday saw Alex and me at Fisherman’s Warf. This time around we visited the back streets and stumbled upon an arcade museum. I laughed, figuring we would see old Pacman games (we did, he played) and some 1950-60 pinball machines. Imagine our surprise when we were met with machines from the late 1800’s and early 1900. There were fortune tellers, creepy laughing clown babies, dancing marionette people and weirdest of all, execution games. 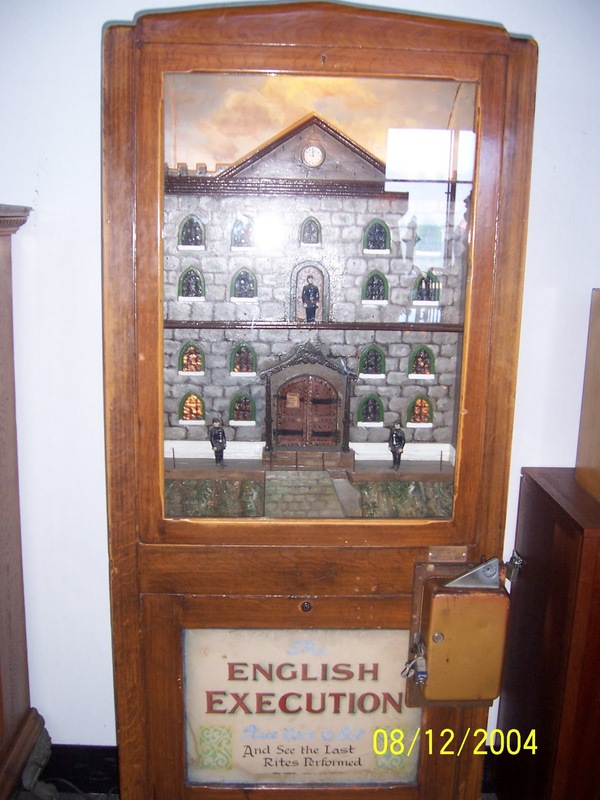 I took some pictures of the strangest games; an opium den and two executions. I am not sure what the attraction of these games were. 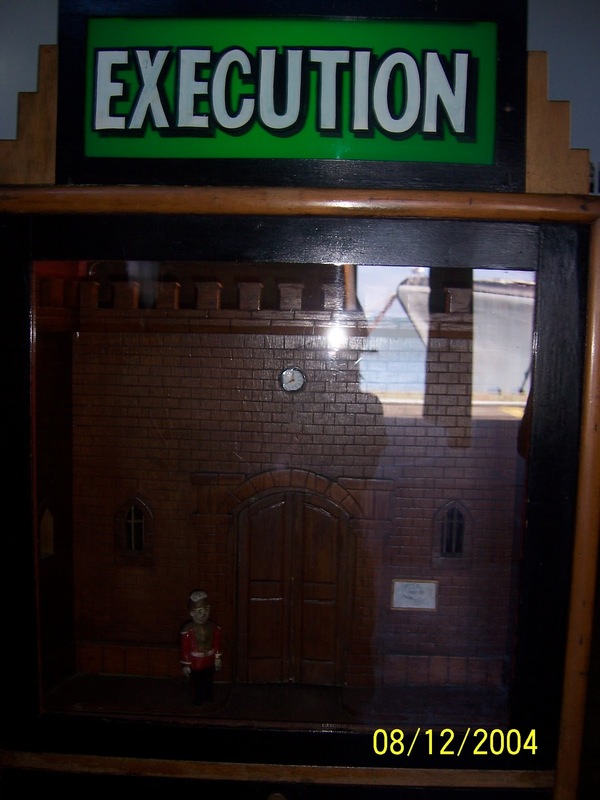 One of the games shows a man being hanged; I thought watching public executions were popular before the enlightenment. Apparently I was wrong. I tried to find the history of these games to no avail. All I learned is that these are from England and date to the late 1800’s. They were called penny arcades and over time evolved into boardwalk fun and finally the games we now have in our homes thanks to Atari and Nintendo. I found some other strange games while surfing the net. Here is a link to a haunted house and Irish wedding. http://bit.ly/a4QpLm. Oh and a creepy kid in a sailor suit. I am not sure this was designed as a game; rather it may have been used as a threat to unruly children. “Be good kids or I will put a penny in this game and make you watch the laughing crazy child”. I know the threat would work on me! Enjoy the pictures. Ignore the dates on the pictures. My camera tends to make its own dates. I am working on a fix. Next blog: The Wax Museum of Fisherman’s Warf wants us to believe Jesus was white. 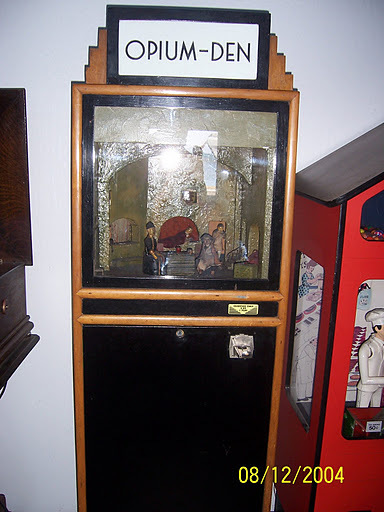 we saw a collection of these at a magic theatre in Vegas once– they are creepy. wonder what the folk from the 1800s would think of all the bloodthirsty games today– they might like them. Wow! This was the first I'd heard of this, thank for the pics Sari. Hello,Thought I would inform you that the book review you did on Dracula in Love was nominated by Sharyla from Bookish Wonderland and is this week's winner.http://endofstorynextbook.blogspot.com/2010/08/book-review-of-week3.htmlI have informed them as well. I am following you and I will totally enter your giveaway. After your review I want to read it.